Plainspoken Coffee. A Coffee Review for Ordinary People by Ordinary People, #14. A review in our conservation organization coffee series. Wild Birds Unlimited Birder’s Blend. Certified Fair Trade and Certified Organic. Shade grown, as determined by roaster (see the review on other Songbird Coffees for that story) from regions that typically grow in shade (Matagalpa in Nicaragua and (Lake Atitlan in Guatemala). Wild Birds Unlimited (WBU) is the largest franchise system of retail stores catering to the backyard bird feeding hobbyist in the U.S. The stores are well-stocked with a lot of very high quality products, and employees, while often not bird experts, are well-trained and knowledgeable about bird feeding and its apparatus. WBU funds the Pathways To Nature grants which fund projects in the National Wildlife Refuge system, and partners with various organizations to support a number of bird conservation initiatives. One partner is the American Birding Association (ABA), and a portion of the sales of the WBU Birder’s Blend go to the ABA, since this coffee is one in the line of Songbird Coffees, one of which we reviewed here. 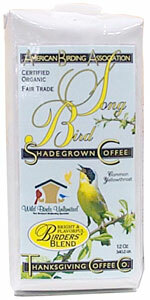 But since many people may first encounter a Songbird Coffee at a WBU store, we thought we’d review it separately. It also gives us a chance to try one more in this line of a number of choices. This was described as a light roast, but it was clearly full city, with all beans shiny with oil and medium-dark brown. The package had no roast date, but there was a decent amount of bloom in the French press, so the beans were quite fresh. However, this is unlikely to be the case if purchased at a WBU store, which probably don’t have huge turnover. The first sip was pleasantly citrusy, very lively and bright. It had a nice sweetness with just a hint of caramel. I think we were all happily surprised, and we found it better than the Panama blend Songbird Coffee. Like that coffee, it also did turn a bit bitter as it cooled, and was better in a drip machine, as it lost some of the brightness and liveliness in a French press. It earned 2.5 motmots, and we think it would turn at least some people on to sustainable coffee, except real cheapos. An addendum: Curiously, the package uses a portrait of the Common Yellowthroat (Geothlypis trichas), a warbler that nests over much of North America. It winters in the southern U.S. and much of Latin America from Panama north (although there are a number of resident subspecies in the tropics). However, it is a species generally found wet areas, including marshes, reed beds, and mangroves — typical lowland habitats –not habitats where coffee is grown. I found only a couple references to this species being found on coffee plantations (in Jamaica), where they were actually much more common in sun coffee than shade coffee. It is certainly not a species characteristic of coffee farms.